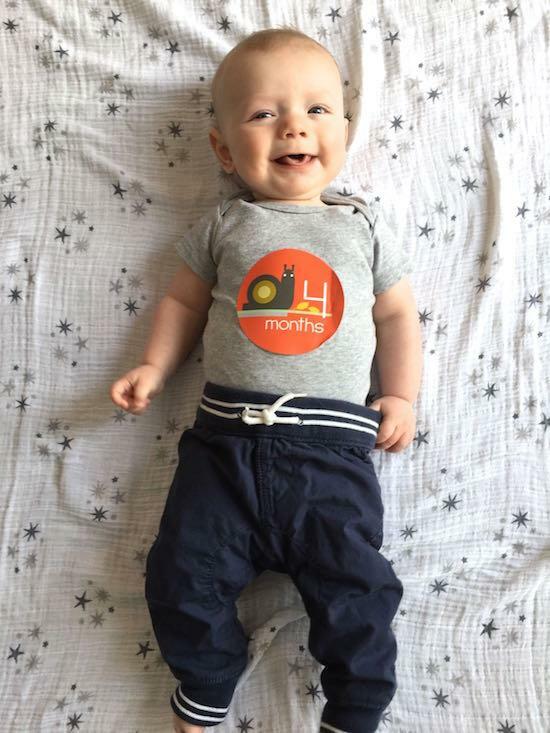 Happy 4 months little guy! Like I wrote in my I Want To Freeze Time post, you’re growing so fast it’s scary! But it’s also awesome. This month was full of amazing changes just like the last three. You’re still eating like a champ. Most days you eat 29 ounces, some days 33, just depending on the timing of your bottles. 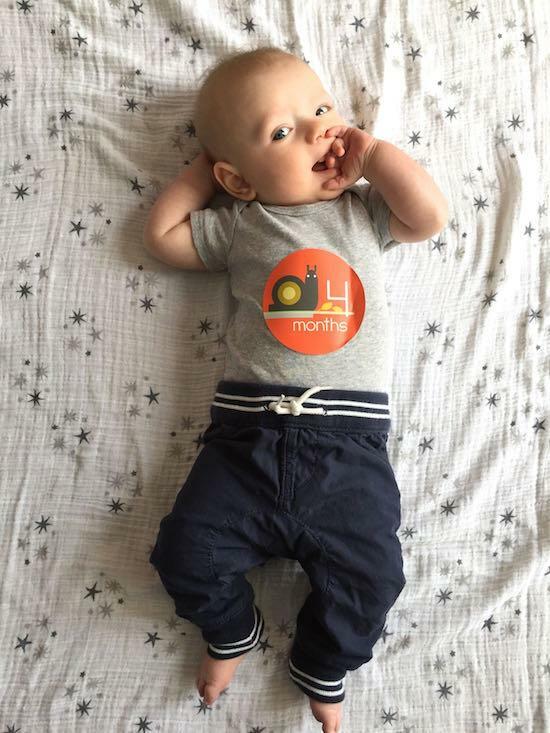 We’re getting closer and closer to starting you on solids but are waiting until you more consistently eat 33-34 oz every day. You’re starting to get more interested in the food we’re eating so I think your time is coming soon! This month you really started recognizing your bottle. You’ll reach out and grab for it when you see it and you’re starting to get the hang of holding the bottle yourself once it’s almost empty. You love to eat and HATE it when your bottle is empty. Daddy always tells you “Every meal has to come to an end” because you scream bloody murder every time you finish your bottle. Sleeping is going pretty well. You sleep in your pack and play now and don’t mind it at all. You usually sleep next to us on the couch from 8 or 9pm until we go to bed around midnight and then I move you upstairs. Typically you’ll eat sometime between 10pm and midnight depending on how your schedule is going for the day and then you’ll wake up to eat sometime between 4-6am. So, most night you’ll have a 6 hour stretch without eating and then go right back to sleep and get up around 8:15am. Mommy bought you some bigger bottles so we can try giving you a bigger bottle before bedtime and see if that gets you to sleep a bit longer. You always wake up happy! Every morning you lay in your pack and play and give us a huge smile when you see us. It’s daddy’s favorite part of the day. You’ve certainly found your voice this month and you’re not afraid to use it. You love to yell (nicely) when you’re on your activity mat, while you’re in your chair, when you wake up in the morning, on the changing table….pretty much anywhere. Our big toy purchase this month was a jumparoo! At first you weren’t quite sure what to do with it but you’re starting to get the hang of it! You focus very hard while you’re in it, which leads to a lot of drooling but it’s fun to watch! Sometimes you like to jump around and yell happily at mommy and daddy. You like to sit in your bumbo while we read books and you LOVE your activity mat. You spend a lot of time there every day talking to your jungle friends! Mortimer the Moose is your absolute favorite toy and you always have him when you’re in your chair or your carseat. You drool constantly and I’m pretty sure it’s an early sign of teething since you’re also very into chewing on everything. I’m not sure when we’ll see your first tooth, but for now you’re content to chew on Morty’s ears, Sophie the giraffe, your binky strap and pretty much anything else you can get your hands on. You figured out how to lock your legs out this month and you love it when somebody helps you stand up! 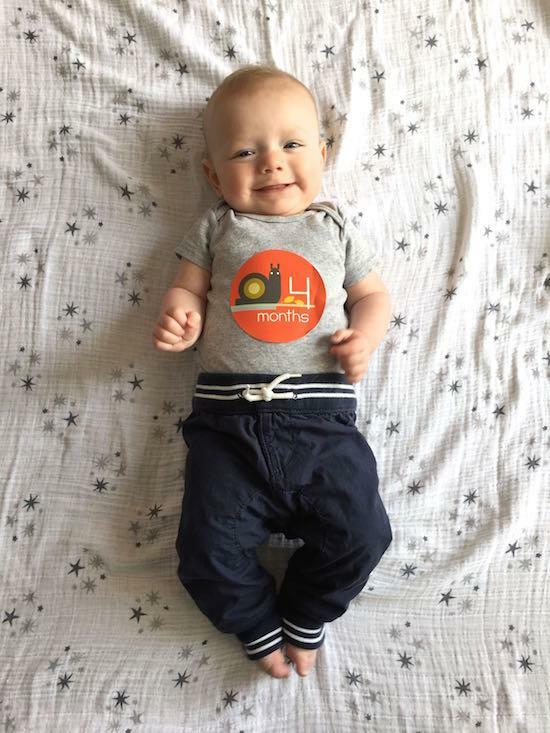 The biggest news this month is that just yesterday you figured out how to roll over from your stomach to your back! You still don’t love tummy time but we keep making you practice and yesterday mommy put you on your tummy and you flipped right over! You even let me get it on video like a good boy! Every day I wake up and think how lucky I am to have you! what a sweet, sweet boy! Oh my, what a sweet little boy! :) love the photos! I see that those food photography skills translate well into baby photography skills. Love his sweet smile! 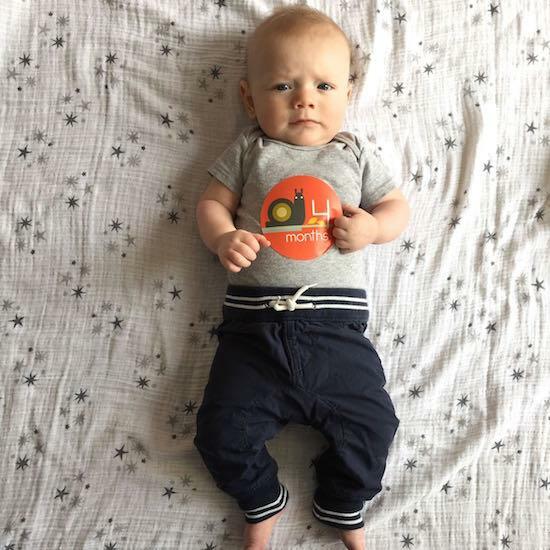 Enjoy your weekend with your sweet little man! Such a sweetie – so happy!!!!!!!!!!!!!!! He’s so precious! Love that little smile! I’m sure he will love reading these when he’s older! What a sweetheart!! 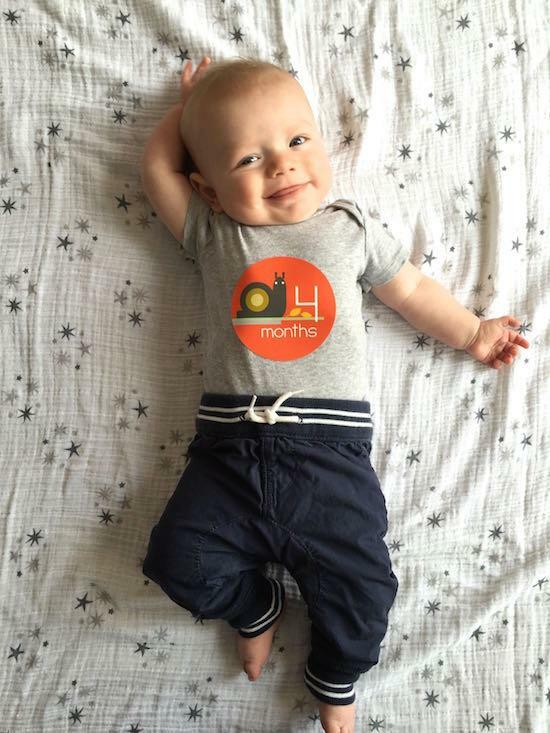 Happy 4 months Chase! Such a sweet post! It’s wonderful you’re keeping record of everything. It will be so wonderful to look back and read in a few years! So much cuteness!! I can’t take it!! [WORDPRESS HASHCASH] The comment’s server IP (192.0.81.104) doesn’t match the comment’s URL host IP (192.0.78.12) and so is spam.